Each piece is artfully created by me in my South Carolina home studio. I pride myself in using hand-selected gemstones and freshwater pearls, artisan-crafted lampwork glass beads, or hand worked and patina metals, along with quality findings, in each and every piece. Your purchase will arrive safely in a pretty jewelry pouch and/or gift box. 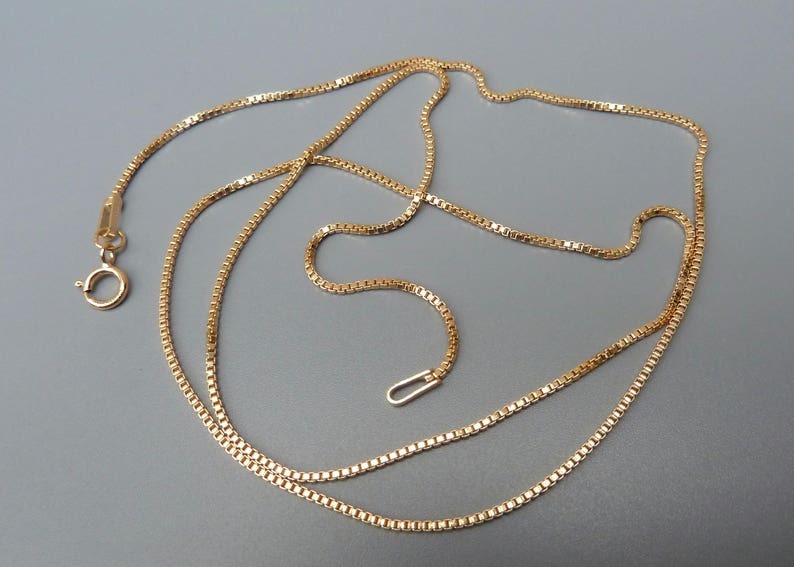 This listing is for a gold filled box chain necklace with spring ring clasp. The chain is 1mm wide and comes in either 24 inches or 30 inches long. I was sorry to hear that the gold filled chain necklace had turned black. All of my chains come from a reputable supplier located in the US and with normal wear the chains should not turn. I highly recommend never showering or swimming with your jewelry on because bath and pool chemicals can have adverse effects on gold filled and sterling silver jewelry. I did offer to give my customer a refund if she returned the necklace at my expense but, unfortunately, she had already thrown the necklace away. Gorgeous long necklace! Just what I was looking for for layering necklaces. Thanks!